Find a short lesson description at the top of the page, along with a summary of general criteria (rating, subject, key words, equipment lists, etc.). The budget amount specifies the cost of one set of equipment; copies for many students may cost more. Clicking on an equipment item takes you to a list of suppliers for that item. Clicking on an image displays the full-size image, if available. The left sidebar shows related lessons and curricula that link to this lesson, or that the author has explicitly recommended, as well as modified copies of the lesson if any. File attachments, if any, are at the bottom of the page. This lesson provides instructions for building a pair of headphones (or speakers) out of inexpensive materials. It makes for a good science project lasting several hours or a quick demonstration in class if you are willing to build ahead of time, though for a single demonstration in class the large paper plate speaker by Jose Pino (linked below) is a better variation. The exercise offers good opportunities for lessons on electromagnets, electric current, and resistance. Construction of a pair of geek headphones from picnic supplies. The principle behind an audio speaker is very simple. An electromagnet (a coil of wire) is attached to a diaphragm and suspended over a permanent magnet. As electric current passes back and forth through the coil, the coil is alternately attracted and repelled from the permanent magnet. As the coil moves back and forth, it pushes the diaphragm back and forth, which in turn pushes air back and forth to produce sound waves. By changing the frequency of the alternating current, different notes can be produced. The key to making a high fidelity speaker lies in finding a light-weight but stiff diaphragm, constructing a good suspension system, and matching the electrical impedance of the speaker to the device that powers it. It's difficult to get much power out of an iphone. Even with high impedance headphones like the ones we built, the sound is quite weak. We had to really crank up the microphone in order for you to hear it on the video. (Most commercial earbud headphones use a more efficient piezoelectric speaker rather than a wire coil.) However, a stereo amplifier supplies plenty of power for a pair of homemade headphones or for the large size speaker indicated below. 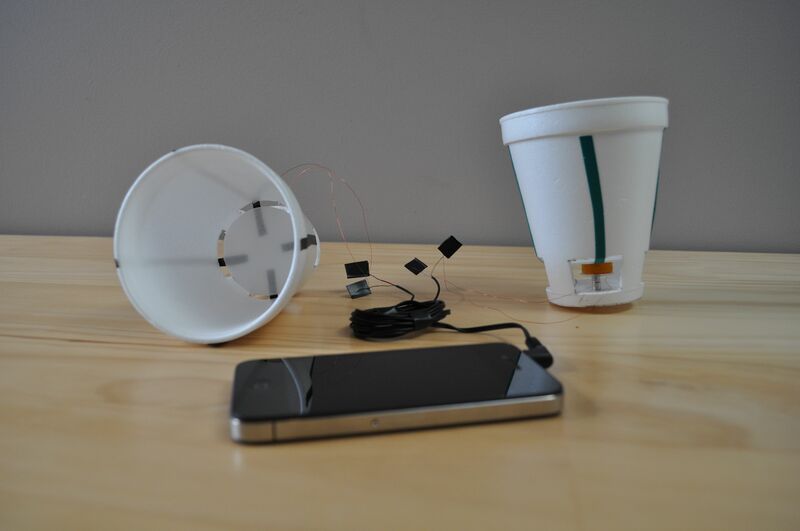 The clever idea for making a speaker out of a styrofoam plate was published by Jose Pino in 2007 in Make Magazine. He posts his original instructions at http://www.josepino.com/?homemade-hifi-speaker. In his design, an entire styrofoam plate is used as the diaphragm, supported on two business cards folded accordion style. That very stiff and light-weight design produces surprisingly good fidelity when connected to a stereo amplifier (better than the headphones in the video above, which are hung on thin strands of electrical tape and connected to an iphone). Fig. 1: Homemade headphones connected to an iphone. Fig. 2: Closeup of the speaker coil. Two small cylindrical Neodymium magnets sit underneath the speaker coil, which is wound on a sewing machine bobbin. The video above shows the basics of construction. Commentary and details are below. Figure 1 shows headphone speakers ready to go. Click on the thumbnail image to see the full size picture. n.b. Some sources for building homemade speakers (including Pino's original design) significantly underestimate the length of wire required to achieve a given impedance. This may not be a big deal when using a stereo amplifier where you can really crank up the power, but it's a little more of an issue when using a low-power/high-impedance source like an mp3 player. It pays to check the wire specifications when building the coil. The importance of impedance matching is often stressed in the design of true high-fidelity stereo systems, but for our purposes may not be critical to the quality of the sound (though it may lower the volume). Nonetheless, it's important to note that if you connect a speaker with much lower impedance than the audio source requires, it may be possible to draw enough current to damage the system. Using a very low impedance speaker on a system that specifies high impedance poses some risk to your equipment. For the most compact design, we use high strength Neodymium magnets underneath the coil. Cylindrical magnets 5 mm in diameter (roughly the diameter of the hole in the bobbin) are about the best. Position them directly under the coil so that the bottom of the coil is just barely above the top of the magnets. The field is strongest right at the end of the magnets and we want to position our coil as close as possible without actually hitting the magnets. If the magnets are too large in diameter, they will interact not only with the magnetic field in the center of the coil (which is what you want) but also with the magnetic field on the outside of the coil that is pointed in the opposite direction. In this case, the two forces on the coil will tend to cancel each other and the coil will hardly move. The diaphragm must be suspended so that it can vibrate easily. Generally this requires a stiff but flexible support. Pino's folded business card support does this very well, acting like a paper spring. Our use of elastic tape is not as good — it damps some of the higher frequencies— but it's easy to apply. 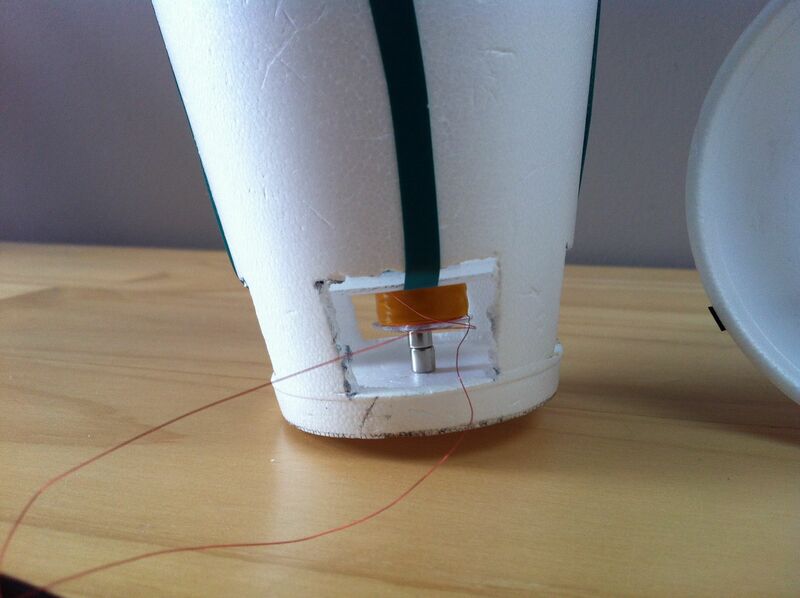 Our headphone speaker might sound better with thread or string instead of tape. Fig. 3: Stereo audio jack with the end wires stripped. 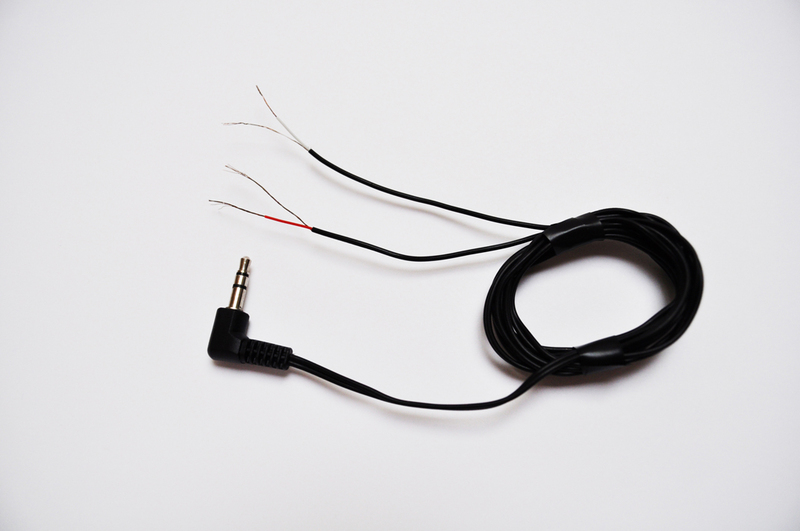 If you are using an amplifier you can connect the ends of the coil directly to the amplifier input (or to some speaker wire that connects to the amplifier). If you are using a portable mp3 player, you will need a headphone jack. You can cut an audio connector cable (if you cut a male to male connector cable you can get two jacks for the price of one), you can take a jack from a pair of broken headphones, or you can you can break a pair of working headphones. In a standard stereo headphone jack there are two insulated cables, one going to each ear. Stripping one of these cables will reveal two conductors inside, separated by insulation (Figure 3). Attach the two conductors to the two ends of the coil. Repeat for the second headphone speaker. You connect your speaker/headphones to an audio source, but you don't hear anything. First check your coil. If you have a multimeter, measure the resistance of the coil to make sure it's what it should be. A broken coil will read infinite resistance. A shorted coil will be negligible resistance. If you don't have a multimeter, you can connect a flashlight bulb and battery to verify that the coil is not broken. If you don't have a flashlight bulb you can connect your coil directly to a AAA battery to see if it will attract your Neodymium magnet. Be aware however, that you should use a low voltage, low current battery (AAA is probably best) so as not to melt your coil. Experience has taught us that a 9 volt battery is dangerous in this regard. Next, make sure that the bare ends of the coil do not accidently overlap, thereby shorting the coil. Finally, crank up the volume on your stereo (or mp3 player). A homemade coil speaker may require considerably more power than the speakers you are used to. You hear sound but it is very faint. You hear frequent clicking or popping as the music is playing. Most likely, the coil is occasionally hitting the magnet on loud sections. Observe carefully, and move the coil if necessary. Alternatively, the lead wires may be rubbing on the housing. Tape them down if necessary. There are several instructions to be found on building other variations of homemade speakers. One good one is the soda bottle speaker by Matt Marone. It may give you further ideas for your own design. 1. In our calculations, we ignore inductive and capacitive impedance and focus just on wire resistance. At the audio frequencies we are concerned with, we believe this component dominates.